As promised yesterday, today I'm going to share with you a meatless version of the delicious frankie - The Aloo Cheese Frankie. Potatoes and cheese - to me that's a match made in heaven. 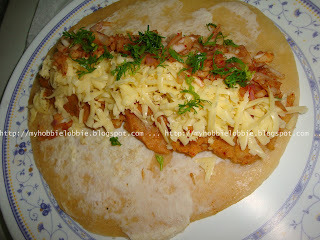 Check out the post on the Chicken Frankie for the naan roti recipe and instructions on how to assemble the frankie. Mix all the ingredients well. Check for seasoning and adjust if needed. Here are the details on the recipe for the roti and the frankie assembly. UPDATE: One thing I'll probably try out the next time I make this, is I'll make a long sausage of the mashed potato filling and lightly fry it off on a pan and then use it in the roll. I would love to see how that works out. Who would say to no to these street food delights..:) I am absolutely bowled over.. Loved it.. Delicious aloo cheese Frankie. Wish you and family happy and prosperous Diwali. Beautiful, too tempting and highly irresistible! !